Add fire to a scheme with Red. 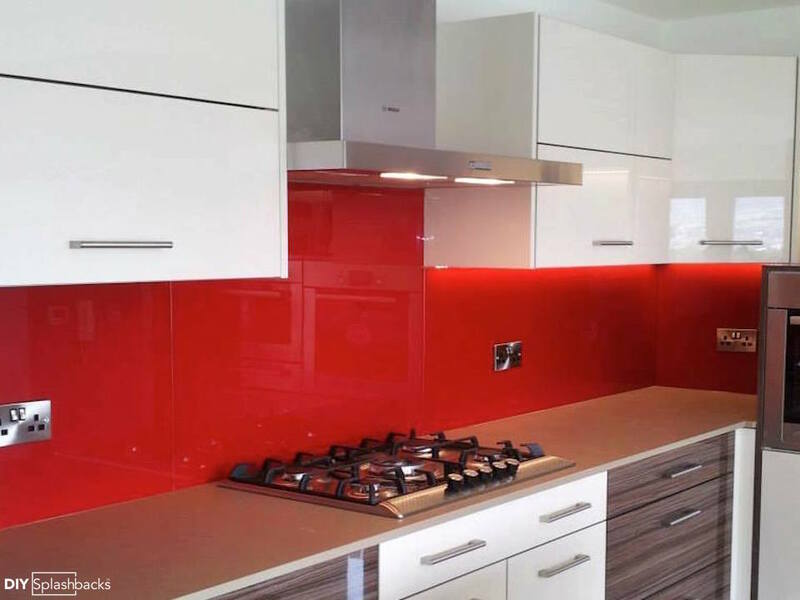 Red has been a popular colour in kitchens for many years, and is definitely one of our best selling coloured glass splashbacks. There are hundreds of shades to choose from, all with varying tones from Salsa Red to Maroon. This section covers some of favourite shades along with some advice to achieving the look you want for your new glass splashback. Teamed with white gloss cabinets, the above RAL 3000 fitted glass splashback packs a punch. RAL is a colour matching system you might not be familiar with yourself, however your kitchen fitter or tradesman is likely to have a RAL deck in their box of tricks. DIY Splashbacks offer glass splashbacks in the vast RAL range. This splashback has been fitted by our Measuring & Fitting Service. Our network of fitters can visit your home for a consultation, then return to fit your splashback around plug sockets and cooker hoods. Find out more about our Fitted Glass Splashbacks service. 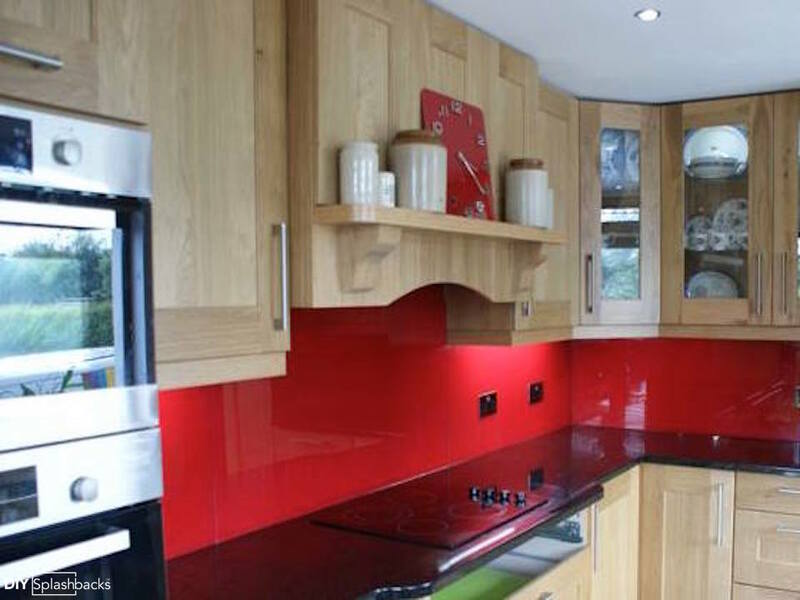 Although popular in modern gloss kitchens, red glass splashbacks work equally as well in wood-tone kitchens. The above RAL 3013 splashback adds colour to this light oak kitchen, and is a bright contrast to the black work surfaces. Adding similar accessories like the clock above continues the scheme. When choosing a coloured splashback, remember colours can appear differently on screen compared to the shade you will receive in reality. The main reason for this is that each device has different display qualities. For example, the screen resolution on an iPhone will be different from that on an iPad, and iMac. In order to guarantee a colour match, we recommend ordering a glass sample on our website. Glass Samples are painted to order, are 10x10cm and are priced at £10 including delivery. If bright red is not for you, why not consider a deeper shade such as burgundy? 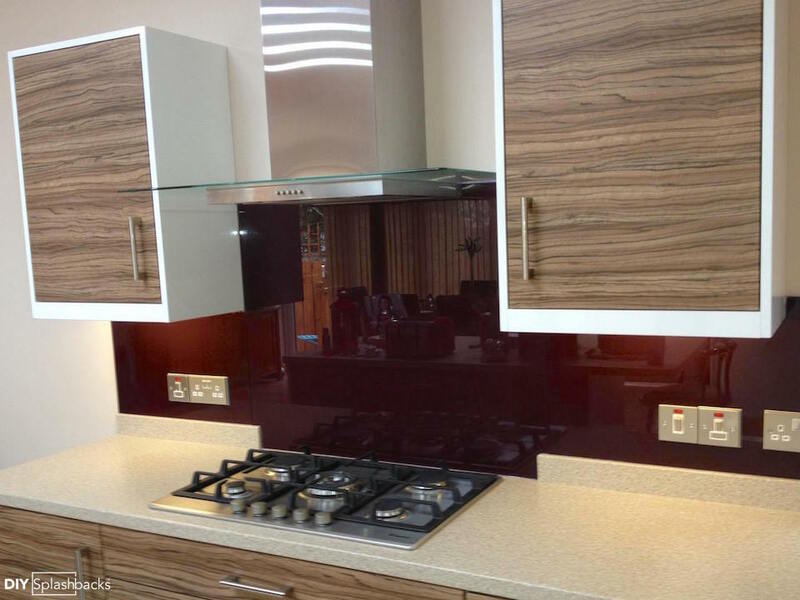 This Dulux Ruby Starlet glass splashback adds drama and works beautifully with the zebrano cabinets. This shade would work equally as well in a Period Home with a traditional or shaker kitchen. 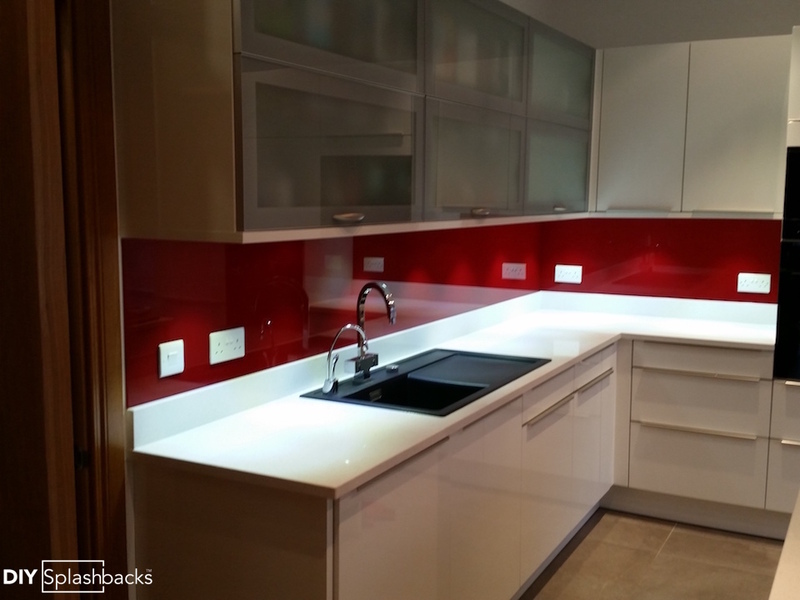 This Farrow & Ball Rectory Red glass splashback shows the importance of good lighting in a kitchen. Getting lighting right is a mix of task, and ambient lighting. Task/Work lighting is used when performing kitchen tasks like food preparation. Ideally, bright enough to read recipes and chop onions. Ambient lighting like the name suggests, creates ambience when you aren’t tasking in the kitchen. This can be in the form of under-cupboard or dim-able lighting. We’re big into personality! 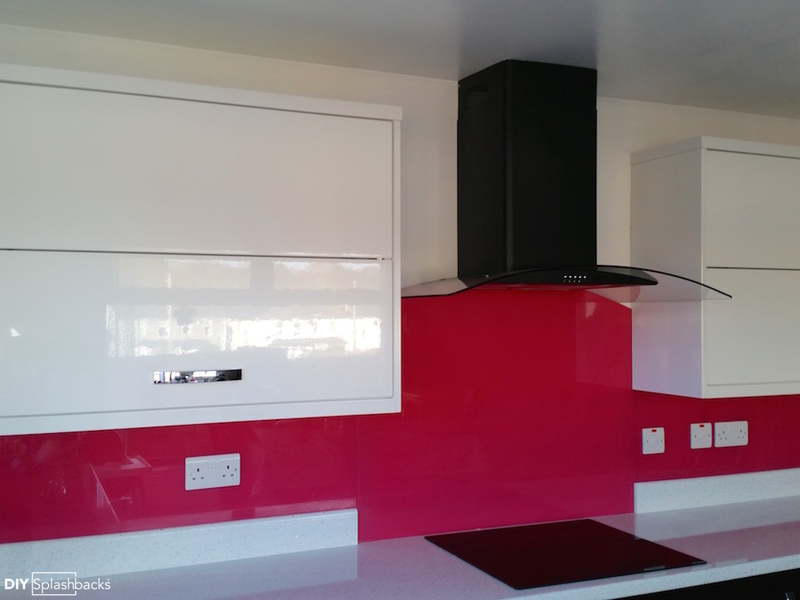 One of our all time favourite glass splashbacks is the aboveDulux Raspberry Bellini. With a slight hint of pink, this show stopping splashback works wonderfully with the sparkle work surfaces, and adds much needed colour to this kitchen. Slightly girlier than some of our other red examples… you might have to convince the man in your home. Similar shades are Laura Ashley Raspberry, and Little Greene Leather.